Skateboarding has been around since the ‘60s, coming all the way from Venice Beach, California and spreading all around the world, according to the Skateboarding Magazine. Chances are if you go to the University of Puget Sound as a faculty member or as a student, you’ve heard the familiar noise of hard polyurethane wheels rolling on the pavement. To some, skateboarding is a way to get from class to class, while others see it as a rebellious, punk activity and criticize people for causing trouble and danger. There has certainly been a decline in skateboard culture over the past decade due to a number of reasons concerning public opinion, safety and time commitment, a reality brought up by GoSkate’s website. However, the scene in Tacoma is anything but slowing down. On campus alone, several students get together, when the weather is permitting, in order to skate with one another and share in the same adrenaline and excitement one can find while on a board. 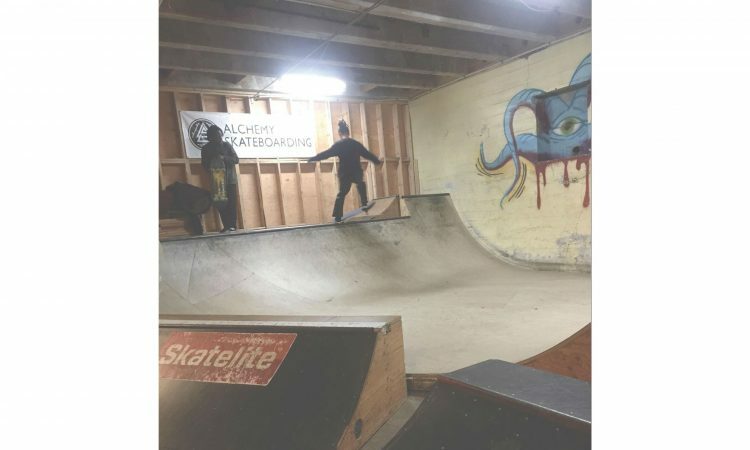 The local shop, Alchemy Skateboarding, otherwise known as Grit City Grindhouse, has been giving local Tacoma youth the opportunity to try a new activity and is showing them the skills and tips they need to progress in the sport. “Alchemy provides a foundation for the skate community that ideally all skate shops should provide,” first-year Caden Briscoe Tai said. With open skate sessions on most Friday nights, anyone who wants can come and skate the indoor park can be surrounded by other people who share that same excitement. “For kids or other people who don’t necessarily understand skate culture and are viewing it from the outside in, it’s hard to understand some of the unwritten rules of skateboarding. Since the dudes at Alchemy have this understanding they can pass the history and understanding of skate culture to others,” Briscoe Tsai said. Without the community created by Alchemy, the scene in Tacoma would be minimal, but since they offer the indoor section of their shop to skaters, it helps the excitement continue even when the weather might not be ideal. “Skateboarding is a really good outlet for kids and Alchemy is a local place that gives them the tools they need to stick with skating and shows them the skills they can work to obtain,” junior Quinn Martell said. According to the Alchemy website, their mission is, “Providing opportunities for youth to learn and grow through skateboarding.” That claim is certainly made true by the welcoming personalities of those who work hard at Alchemy to ensure everyone who wants to skate has the equipment, safety and resources they need. That same mentality bleeds onto the campus and has certainly sparked more interest in skateboarding with several new students joining in on the community. The most popular spot for skaters to go is the seal of the University, since Commencement Way is smooth and isn’t too busy besides passing periods throughout the day. Other spots around campus include parking lots and any sidewalk without too many bumps and cracks. Off campus, though, Tacoma hosts a few smaller sized skate parks that several students go to on the weekends when it’s not wet outside. Kandle Park is a close favorite for many students since it’s only a five-minute drive and offers a bowl as well as what some call the “concrete wave.” A community park surrounded by neighborhoods, Kandle Park sees several little kids watching the skaters and getting excited when they land a trick. It’s true that the weather can definitely put a damper on skating from time to time, but the next time it’s sunny out, make sure to listen for that ever-so-familiar noise of a board popping into the air and come take a look for yourself.